The application of force causes pressurized air within the gas struts to compress. This action causes resistance and allows some of the energy of the jolt to be absorbed by the gas before being dissipated in order to protect adjacent components or more sensitive equipment. Although metal coil springs may often be used in similar applications and with similar results, gas struts provide smoother shock absorption and damping as well as the ability to control the rate of motion. This is because compression and decompression within these gas springs occurs at near constant rates, allowing engineers to design elements without concern for the snap back that commonly occurs with mechanical springs. The compact size and clean operation of these devices also makes their use advantageous in many operations where space is at a premium or sanitation is important. Gas struts may also be adjusted as needed whereas worn or inadequate mechanical springs must be replaced. Adjustability and locking mechanisms should be considered as well as additional physical specifications such as cylinder size, maximum width and mounting configurations. Performance specifications such as working temperatures, absorber stroke, compressed and extended lengths, maximum force, maximum cycles per minute and load capacity should also be compatible with intended use. While individual models will vary slightly, the basic design and operation of gas struts is similar throughout the many different applications. The strut is basically configured like a pneumatic cylinder. A sealed tubular body houses all of the other components and is most often made of steel, stainless steel, aluminum or durable thermoplastics as needed to suit the conditions of a given application. The outer and especially the inner surface is polished to a smooth surface to reduce unnecessary friction for the piston head that is fitted along the cross-section and slides along the barrel when activated by force on the attached piston rod. 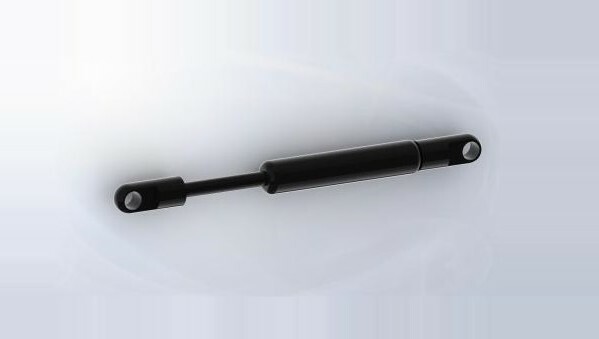 This rod is attached internally to the piston, but externally to the equipment it is charged with supporting or protecting. Elastomeric or metal seals and o-rings provide airtight closure around both the exit point for the rod and the piston head, thereby dividing the main chamber into two smaller airtight compartments. High pressure gas is contained in one of these cylinders in precise amounts. When force is applied to the rod or attached mechanism, the piston is pushed in toward the opposite end of the cylinder, thus compressing the gas. This action allows energy to be dissipated and movement slowed as needed to isolate vibration. When the external force subsides, the pressure of the compressed gas moves the piston rod back out to its resting position. Gas Struts Gas struts are braces or suspension units designed to resist thrust and longitudinal compression. Used in the design of many industrial machines and processes, struts are also commonly employed in automotive suspension systems, door hinges, architectural braces, engineering and aircraft wings and landing gear. The basic function is that of a compression air spring.